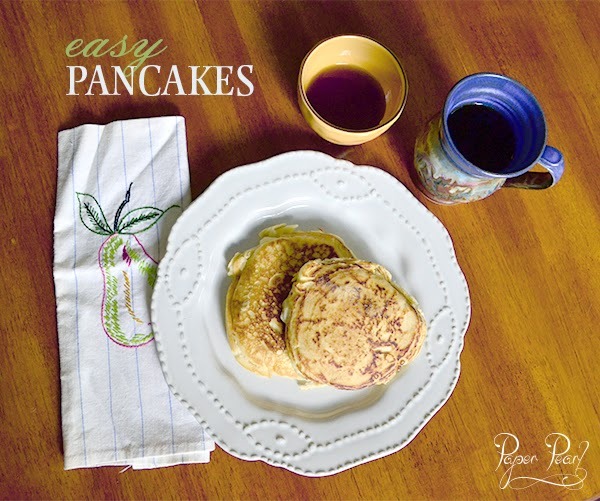 Paper Pearl: Tasty Tuesday: Easiest Pancakes Ever! Tasty Tuesday: Easiest Pancakes Ever! A couple of years ago, my cousin and I had a joint wedding shower with our side of the family. We were getting married a week apart from one another so the celebration was a good excuse for a backyard family party. We were both gifted ingredients for our pantries along with family recipes. This pancake recipe is the easiest I have ever made and the pancakes are so good. These were my great-uncle's pancake recipe and it's so easy to remember after you make it once. Just think: 1-1-1-2-2-2. That's pancake code. Use 1 egg, 1 cup flour, 1 cup milk (I use coconut milk) then 2 tablespoons of: baking powder, sugar, vegetable oil. Mix it up, cook it up, eat it up. Super easy...why are you still reading? Go make pancakes! TGIF: Thank Goodness I Found Sailboats! TGIF: Thank Goodness I Found Lawn Game Fun!